you couldn't get stories straight in your inbox. But now you can! This post marks the end of my baby quest for taste… as Tiny A just turned one last week and is formally a toddler (walking and everything!). I’m super late with this post, and doing a month and a half time-span now, as we were away in Mexico visiting family. And you will see that our taste bud adventures took on a very Mexican turn. Chocolate (for his birthday cake, and he loved it and didn’t have adverse effects). He tried different types of Mexican dishes, such as cochinita pibil, tacos al pastor, churros with sugar, molletes with beans and cheese, he’s a big fan of quesadillas, pozole and he ate Oaxacan tamales with chicken in tomatillo sauce. I do love the fact that he’ll try everything, and savor what he eats. His favorite foods right now are eggs pretty much prepared in any way, meat, and some greens (he’ll eat spinach, peas and green beans delightedly). He’s not too big on fruit, and he favors blueberries, watermelon and peaches over anything else. My biggest disappointment was that he didn’t fall in love with the delicious mangoes from Mexico. Right now he’s getting a huge appetite, so I suspect he’s going through a growth spurt… And once we came back home, he’s starting to FINALLY sleep through the night, once more. Our next adventure will be weaning and introducing more elaborate meals… as well as teaching him to use utensils. Up to now he’s been eating with his fingers, which also limits a bit of what I can give him. He’s been trying using the spoon and the spork, and I believe he might be pretty close to succeeding. So, if you’ve kept with us so far in this quest for flavor, there is definitely more to come! Worked in film and TV for several years before having my two wonderful children. Now I try to bring that creative input into my home to raise my kids. Hope you enjoy following this journey! Tagged Baby, Baby food making, Menu ideas, weaning to solids. I’m no baby, but there’s something about the spork that makes eating more fun. I haven’t figured it out yet, but I LOVE sporks! Haha. My computer wants to auto-correct spork to spark…clearly spell checker is NOT a spork fan. Haha. 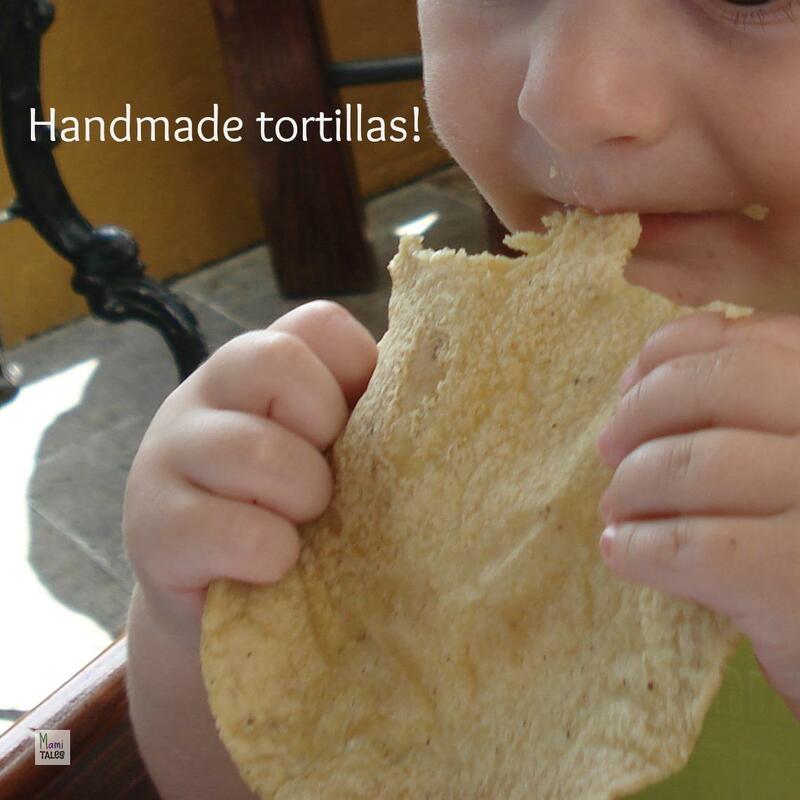 Those homemade tortillas look SO yummy! I tried making some once…epic fail. I’ll still with sweets! Haha. Anna, I’ll take a picture of the spork handling once he masters it for you 🙂 We had the tortillas at a restaurant… as I’ve not try to do them on my own just yet. Maybe I should try and post the results! That’s awesome!!! Luke still hasn’t had peanuts. A friend said since he has some reactions from food, he might be more susceptible to peanut allergy. makes me so nervous! But he is eating like a champ now and sometimes even out-eats his sister!!! That’s awesome that he is eating so well. Pumpkin was eating well until a month or two ago and now she refusing most everything. Sometimes she will try it the second time it’s offered. Hopefully it’s just a phase. How odd… maybe she’s teething again? My daughter did eat most things and as she grew she turned more and more picky… I think you should just keep offering her all sorts of food! I'm a film and TV writer-director, married to a scientist, mom of two gorgeous little children, raising them bilingual and bi-cultural; I was born and raised in Mexico and hope to share with my children the love for my language and traditions. Join me here to find useful information on great reads, yummy children-proofed meals, science activities and more!